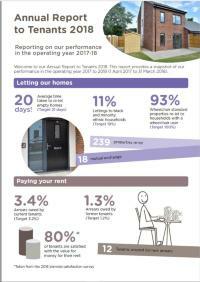 The Annual Report to Tenants 2018 reports on Habinteg's performance in the operating year 2017-18 across a range of key areas, comparing our actual performance to annual targets. We appreciate your feedback on the Annual Report to Tenants. Please feel free to send your comments by email or contact Habinteg Direct.